What is the best IHG Rewards Club hotel at Heathrow? IHG is not short of hotel options at Heathrow Airport which is good news for anyone looking to boost their IHG Rewards Club points, redeem their points for a free room or benefit from their elite status. There is even a dedicated IHG website for its Heathrow properties which you can find here. There is a lot going on with IHG at Heathrow at the moment. 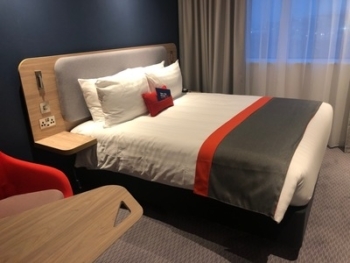 We reviewed the new Crowne Plaza and Holiday Inn Express at Terminal 4 recently (click to see those) and we attended the relaunch of the Holiday Inn M4 J4 recently. A new Staybridge Suites has literally opened this week (website here) and a Holiday Inn in the same building opens in January. This will take the group up to nine hotels in and around the airport. The brand new Crowne Plaza London Heathrow at Terminal 4 is, in my view, the clear winner here. It is a very classy operation, with the benefit of being directly connected to the terminal. 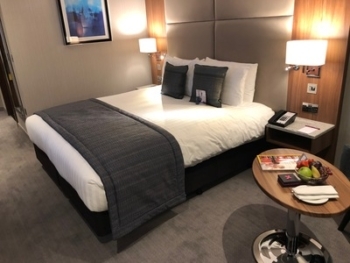 We reviewed the Crowne Plaza London Heathrow T4 here and a photo of my room is below – I also found the restaurant to be excellent. The hotel site is here. Note that the executive lounge is not open yet but is due in January. 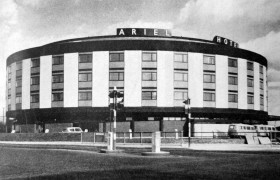 If you main concern is cost whilst still earning IHG elite night credits, you can’t beat the single rooms at the Holiday Inn London Heathrow Ariel pictured below in its original 1961 glory. I can see this getting a Grade II listing soon! I can remember when the Ariel was available for £29, but you are more likely to be paying £50ish these days. For a more modern property with free breakfast (and double beds for a similar price to a single at the Ariel), try the Holiday Inn Express London Heathrow T5. A friend I questioned was very positive about the HIX T5, praising its ease of access from the M4, the excellent sound insulation and the ability to grab a snack from the M&S Simply Food in the petrol station across the road. Let’s be honest, I’m not sure why you’d want to have a long stay at any Heathrow hotel. However, the ‘so brand new it has only been open a week’ Staybridge Suites London Heathrow Bath Road looks like the best option if you do need to stick around. All rooms here include a fully equipped kitchen and you can get a one bedroom suite for £100 on some nights. As an added bonus, all guests get free breakfast too. I will take a look at this in the New Year. Whilst I have never stayed here myself, a friend recommends the rooms with runway views at the Holiday Inn London Heathrow T5 for any ‘aircraft enthusiasts’. These cannot be requested when booking online but are often given as upgrades to elite members, apparently. This hotel is not attached to Terminal 5, for clarity. the Holiday Inn London Heathrow T5 has family rooms which contain a double bed plus two rollaway beds. There is no free breakfast at Holiday Inn properties, however. 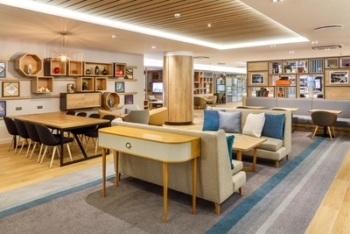 the new Holiday Inn Express London Heathrow T4 is the best value family option, especially as breakfast is free and it is connected to terminal. You can get rooms with a double bed and a double sofa bed. if you want a kitchen unit to prepare your own food for your family, the obvious (and only) option is the brand new Staybridge Suites on Bath Road, where the cheap one bedroom suites have a sofa bed in the living room. Staybridge Suites hotels provide free breakfast. 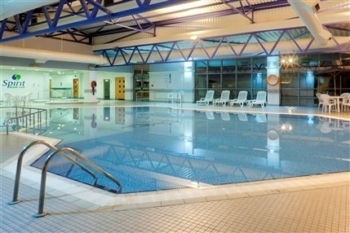 If you’re looking for an excellent swimming complex, I strongly recommend the Crowne Plaza London Heathrow which is on the north side of the M4. I stayed here last year and my kids loved the huge pool complex. I wrote this article on the best hotel swimming pools at Heathrow and the Crowne Plaza was the winner. There is also a sauna, jacuzzi and a good gym. The rooms are about to undergo a refurbishment and this will become the first Crowne Plaza to feature a new chain-wide room design. Best IHG hotel if you want a funky lobby! To be honest, the Holiday Inn London Heathrow M4 J4 did not get much enthusiasm from my panel. However, I sent someone down there a couple of weeks for an event to showcase their new lobby and restaurant concept. The old Irish pub has been transformed into ‘Terminal 6’ which is a surprisingly classy bar. 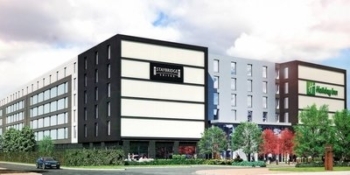 There are eight IHG hotels at Heathrow Airport, and that will increase to nine when the new Holiday Inn London Heathrow Bath Road – which shares a building with the ‘already open’ Staybridge Suites – opens in January. Please chip in with your views in the comments and I will add in the best ones during the day. PS. To be honest, I would be tempted to add the Hotel Indigo just outside Paddington Station to the list! You get the benefit of spending time in the city centre and, if you time it right, you should be able to get from the hotel to Terminal 5 within 30 minutes via Heathrow Express. I’ve only stayed at the HI T5 once and that was to hit an accelerate offer. Following that stay I’d only stay again if there was nothing else available at a reasonable price. What is useful is to book parking at the NCP at the Hilton T5, this includes free Hoppa tickets and the HI is only a short walk. Also, there is a pub called the Ostrich which is pretty decent about 10 minutes walk away. Not far from the HI Ariel is a pub called the Pheasant which is fairly decent too, always busy which is usually a good sign. Has anyone had the free night voucher for spending £10,000? If so, how long does it last for please? and how easy was it to use? Need to book within 12 months (can’t remember if you need to stay within 12 months or not), vouchers shows on your IHG account when you log in, there is a separate booking process but basically you can use it wherever there is reward availability. Don’t need to stay during 12 month validity period however effectively becomes non-refundable after that point, before then if booking canceled it just reappears in account. Free night clearly highlighted on IHG and extremely easy to book with identical availability to general rewards nights as you say. Do you happen to know how long after the 12 months date you can use it for? As far ahead as you can book, so should be 12 months from date of booking. O/T – Does buying IHG miles stop existing points from expiring after 12 months? No status as mainly do Hilton stays, but don’t want to lose existing points with IHG. Thanks Rob for that useful info. T5 HIX is in the middle of nowhere – the trick is to forget the hoopa and use a local bus. Regular enough even in the very early hours. Not TfL though so be prepared to pay. I actually like the Aerial. Close to some noisy runway manoeuvres if you like that kind of thing (you can close the window if you don’t) and a free tfl bus to any terminal I think. Great place even if a bit shabby! HIX T5 – stayed twice, low prices (£40-45 a night), a very modern and nice hotel, next to a picturesque village with a couple of pubs, amazing running/jogging options around the Queen Mother reservoir with planespotting just overhead, a short bus ride to Runnymede with its Air Force memorial and upscale dining options in nearby Egham. Windsor and Eton are also close. RECOMMENDED. HI Ariel – stayed twice. Very close to Heathrow itself and original in design but this hotel is DREADFUL. So old and shabby, doors and furniture are falling apart. Breakfast (paid!!) was underwhelming. NOT recommended. HI M4/J4 – stayed two nights very recently. The hotel is ‘yuge’, it’s really massive. Difficult to access from airport by public transport though. Starbucks in the lobby is ridiculously expensive (like 50-75% upmark to C London prices). Terminal 6 looks good. The area should look nice in summer – they have a small mini-park outside with lots of outside furniture. Rooms were good as well. Lots to explore nearby: Harmondsworth with its famous barn, new Harmondsworth Moor Park built by BA (at least something good this airline does!) on a former landfill site, a few nice local pubs and restos. RECOMMENDED in principle. Next much anticipated stop for us – the new double hotel of SS/HI on Bath Road when it opens with brilliant transport and planespotting options. the old crowne plaza has age restrictions for the club lounge.